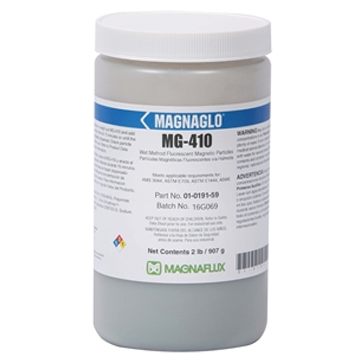 MG-410 is an ultra-bright fluorescent magnetic particle powder for locating small, medium, and large discontinuities. These particles provide clear, ultra-bright, fluorescent green indications under UV light with minimal background. MG-410 is designed for use in water or oil baths for wet method fluorescent magnetic particle testing. MG-410 is fluorescent powder which can be mixed with either water or oil for a wet-method inspection of metal parts. It detects medium to fine surface and slightly subsurface discontinuities such as cracks, inclusions, seams, tears, laps, flakes and welding defects. Indications appear an intense yellow-green under UV lighting. Conditioners for water baths such as WA-2B powder or WC-1 liquid should be used for anti-foaming, corrosion inhibiting, as a wetting agent and to facilitate particle suspension.